C. Marvin Pate, Apostle for the Last Days: The Life, Letters, and Theology of Paul (Grand Rapids: Kregel, 2013). C. Marvin Pate is professor of Christian theology at Ouachita Baptist University and an author and editor of a number of books related to biblical studies including Four Views on the Book of Revelation, The Writings of John, Romans, and From Plato to Jesus. In this present work, Pate argues that, “Paul’s life, letters, and theology are unified by the theme of the overlapping of two ages—this age and the age to come.” The book is divided into two unequal parts. 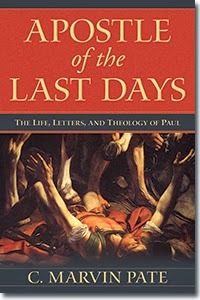 The first and larger part relates to the life and letters of Paul. The second and smaller part draws conclusions from the first part in an attempt to outline Paul’s theology. The book is well organized and there are numerous helpful tables and lists. There are several reasons that I like this book. First, I appreciate the fact that this work seeks to understand Paul in both a Jewish and Greco-Roman context. While Pate often shows how Paul differed from both Jewish and Greco-Roman positions, his treatment frequently identifies the contingent links in Paul’s epistles. Second, Pate does not follow the critical tendency to pit the epistles of Paul against Acts. He tends to view Acts as a complimentary, rather than competitive, source for understanding Paul. Third and similarly, Pate rejects the typical critical position that there are only seven genuinely Pauline epistles. This is refreshing and of course affects the conclusions that one draws about Paul’s theology. However, these critiques do not rob the book of its value. Those who have some academic training in biblical studies and an interest in Paul or eschatology will likely benefit from Pate’s treatment. Thanks to folks at Kregel for providing the review copy utilized in this unbiased review.